Be sure to stop inside the skate house and peruse the perennial quarts, gallons, and herbs. Humus will be on sale for $4 per bag and is great for the lawn or your gardens. It is so easy too, with our convenient drive through. We will load all the bags of "black gold" humus right into your vehicle! 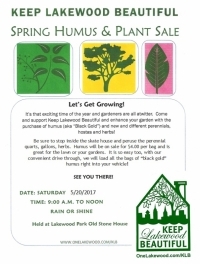 Held at Lakewood Park Old Stone House rain or shine! The Keep Lakewood Beautiful (KLB) organization was initially created in September 1982 to promote civic involvement through public interest in the general improvement of the environment of Lakewood. It maintains an affiliation with Keep America Beautiful. The volunteer board serves a four year term and initiates, plans and coordinates programs for litter prevention, solid waste reduction, recycling and green space beautification such as Earth Day, Great American Cleanup, Spring Humus Sale, nearly 40 Adopt-a-Spot Gardens, Beautiful Home Awards, and the Tree Committee. New programing is always being developed, and new volunteers are always welcome. For more information or to join the Keep Lakewood Beautiful organization as a board or committee member see: http://www.onelakewood.com/KLB , or call 529-6601.